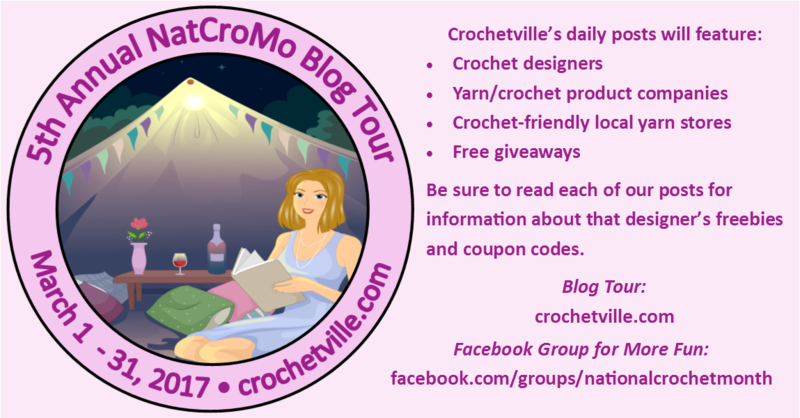 Stitch Story: Crochetville 2017 Designer Blog Tour! It's that time again! National Crochet Month! Celebrate with Crochetville all month long! Crochetville has lined up a host of designers and a collection of giveaways. Follow the tour with daily posts from the designers who will be doing special posts in honor of the month. I am scheduled to post on March 2nd, and I am going to be offering one of my patterns for free for a limited time, so please visit my blog this Thursday to get the code to download it from Ravelry. It will be a fun month, so plan to add the tour to your blog reading list every day!